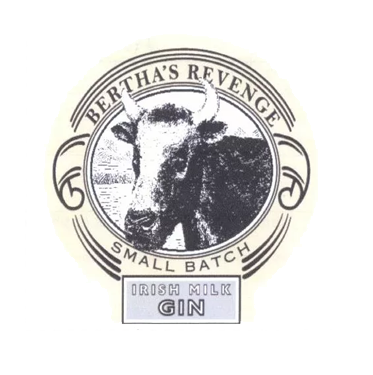 Bertha's Revenge Irish Milk Gin is made using whey alcohol from local dairy farmers in Co. Cork, natural well water from the farm at Ballyvolane House and an interesting mix of locally foraged and imported botanicals starting with a traditional base of juniper berries and coriander seeds, citrus peel (bitter orange, sweet orange, lemon, lime, grapefruit), roots (liquorice, orris, angelica), spices (cinnamon, cardamom, cloves, cumin, almond, Alexanders) and florals (elderflower, sweet woodruff) and bitter almonds. The botanicals are steeped overnight for 15 hours before distillation in 125 litre stills. TASTING NOTES: Nose – jaunty juniper leads, followed quickly by the spicy and warming notes of cardamom, cumin and sweet citrus. The complexity of Bertha is evident and enthralling. She demands to be tasted. Palate – our whey alcohol base comes to the fore on the palate. Like a conductor of an orchestra, she holds and releases the different notes to maximum effect. Effortlessly smooth from the start, sweet orange, coriander and peppery Alexanders are joined in a warming motherly caress of cumin, clove and cardamon. The generous nature of the spirit washes over the palate, finishing in a gentle spice-tinted heat that delivers and considered murmur of approval from your taste buds.